Wake up + Grind. I can't believe it took me so long to get around to trying out Shoreditch Grind. For goodness sakes, I went to school just up the block and would walk past everyday saying that I'd stop in sooner or later. I went in during my last few days in London and that was so bittersweet. Shoreditch Grind is place that makes you want to come through its doors. From the cute neon sign that reads " Cocktails baby?" sign to marble tables. It's definitely a great place to come and get some work done or even just a midday pick me up. They play easy going tunes and just have a warm vibe all around. The BEST part! I was super excited to try the food here because it was so pretty on the outside the food just had to be bomb and that it was. I ordered the Avocado Toast with a poached egg. I also had an iced coffee on the side. Man, talk about flavor. I really didn't know what to expect from this avo toast, but the bread and avocado were so fresh. Not to mention, the chili flakes on top added the nicest hint of spice. I've become such a big fan of Shoreditch Grind. 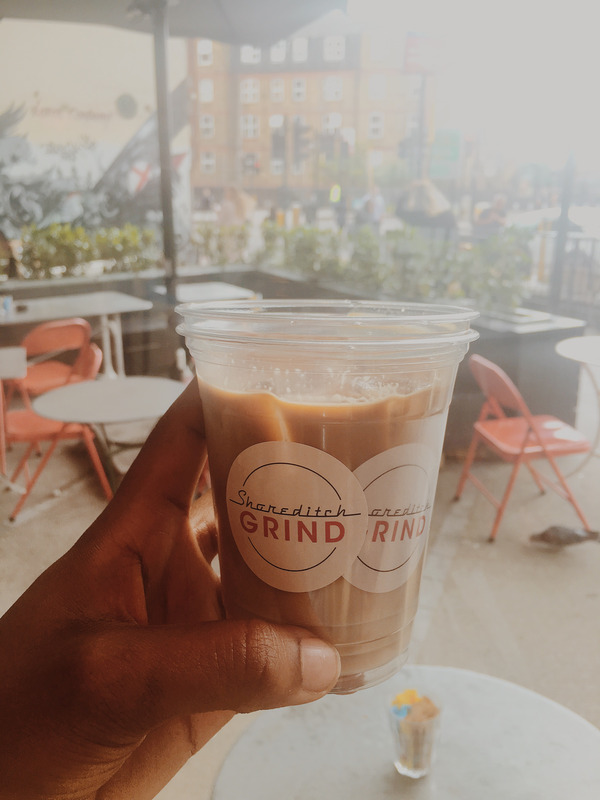 I can't wait to be back in London and hit up all of the other Grind locations. The concept is so simple yet it works magically! The place is mad vibes and I can't get over the #yolkporn that I experienced, delightful. You. Me. Lunch. started as a saying between my best friend, Khaila, and I. It's been our way of saying 'see ya later' since we were seven years old. I guess you can say I'm an actual food baby. Founder and blogger at You Me Lunch. An online travel and food diary, where travel is inspired by food.